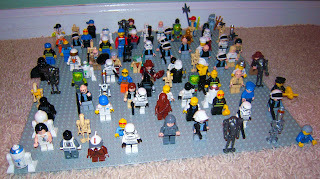 "There are 91 minifigs in this army. You can practically have 41 bad guys and my army would just blow the bad guys right up. One guy is armed with an umbrella as a parachute for high jumps and to poke the bad guys. And there's a shark (at the back right corner) that has a spear and when he pokes someone with it, he destroys every bad guy. My army is so powerful that all my posts combined wouldn't be as powerful as it."